South Korean shooting legend Jin Jong-oh will try to add one more honor to his already-decorated resume on Tuesday by winning the men's 10-meter air pistol event at the 18th Asian Games. Jin, who won four gold medals from the last three Olympic Games, has three Asian Games gold medals, but all of them are from team events. He has one silver and three bronzes in individual events. 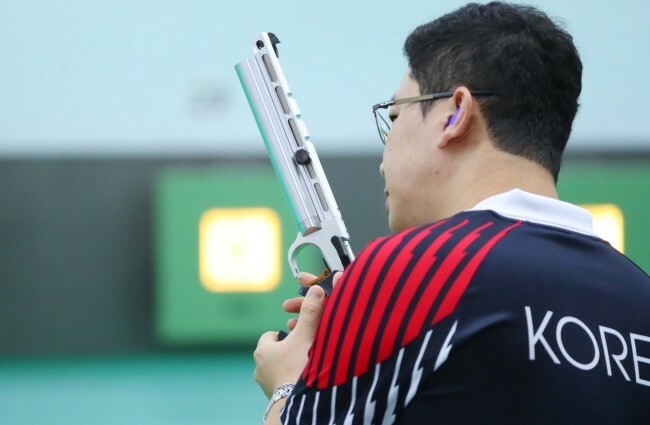 In what could be his final Asian Games appearance, Jin will aim to get his first individual Asian Games gold medal in the men's 10m air pistol, the only event that he will participate in the Jakarta-Palembang Asian Games. Elsewhere, South Korea will try to add more taekwondo golds in "kyorugi," or sparring, events. Lee Ah-reum will compete in the women's under-57kg division, while Lee Da-bin will perform in the women's over-67kg category. Lee Ah-reum is currently ranked second in her weight division. She claimed a gold medal at the World Taekwondo Championships last year. On the men's side, Lee Seung-hwan will go for gold in the men's over-80kg contest. South Koreans will also pursue their gold medal hunt in swimming with their two female stars. An Se-hyeon is expecting a gold medal in the 100m butterfly, while Kim Seo-yeong will race in the 400m individual medley. In fencing, Ha Tae-gyu and Son Young-ki will vie to deliver the men's foil individual gold, while Kang Young-min and Cho In-jeong will compete for the women's epee individual gold.